Be sure to check out the full list of all Mecklenburg County parks. Within its 5.4-acres are two gardens, a courtyard with tables and chairs, a green field for hosting large public events, a play area with various chimes, and multiple waterfalls. Aside from the spaces the park offers for leisure and relaxation, it’s aesthetically pleasing and artistic feel appeals to almost anyone and gives park goers a reason to come back. The park was designed and named after local artist Romare Bearden’s collection of paintings and collages, and is certainly a sight to see. 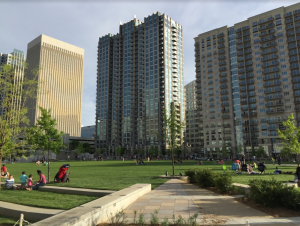 A slightly smaller neighboring park to Romare Bearden, First Ward Park has a variety of mixed-use buildings including hotels, office buildings, restaurants, UNCC, a parking deck, and more within the 4.6 acres. “First Ward Fridays” have become an annual event at the park, in which you can bring the family and enjoy a few beers from the popular OMB Brewery while playing games and activities like giant connect-4, chess, corn hole, ping pong/beer pong and jenga, among a few more. There’s live music, food truck vendors, kids and adults of all ages, and plenty of fun and sunshine. The smallest of all center city parks, Fourth Ward is a 3-acre urban park and nature preserve which is home to the Summer concert series “Picnic in the Park”, at which a different musical artists put on a live performance Sundays from 4 to 5:30. This park includes walking trails, a playground, and water fountains. Freedom park is the largest of all four Uptown parks. Its 98 acres are centered around a 7-acre lake, and is the location of the annual five-day long “Festival in the Park”, which attracts over 100,000 people every year and has been recognized as a Top 20 Event by the Southeast Tourism Society. The park houses many of Charlotte’s popular attractions like the Charlotte Nature Museum and a large steam engine which you can climb into the cab, in addition to playgrounds, sports fields and courts, picnic shelters, an amphitheater and more.